May was an INTENSE month here at the Ali Does It household. LongJohn went to daycare a month earlier than scheduled and I had a whole four weeks to get all the stuff done on the house I hadn’t had an opportunity to do when we moved in … because of the whole having-a-baby thing. Some of those projects are still in progress but I have SO MUCH to show you when they’re ready to be shown. If May was intense, then June is even more so. I went back to work full time AT A NEW JOB. And on my first day, I had HAND surgery. Today I’m having hand surgery on the OTHER hand. So things are a little nuts, to say the least. Luckily I have a bit of a backlog of posts for you guys. Let’s start with this one for the barbecue, now that we’re officially into grilling season. The Pie is a huge fan of souvlaki. 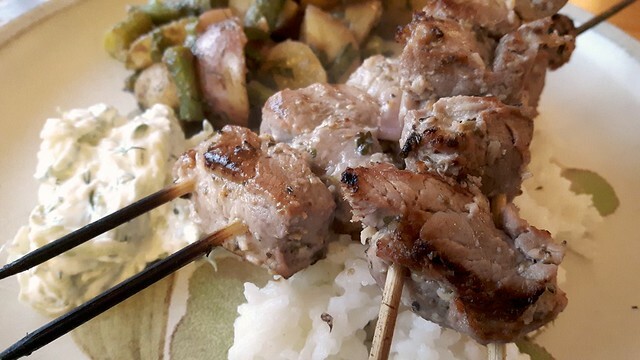 We’re fortunate that some of the best souvlaki in town is only a short drive away. 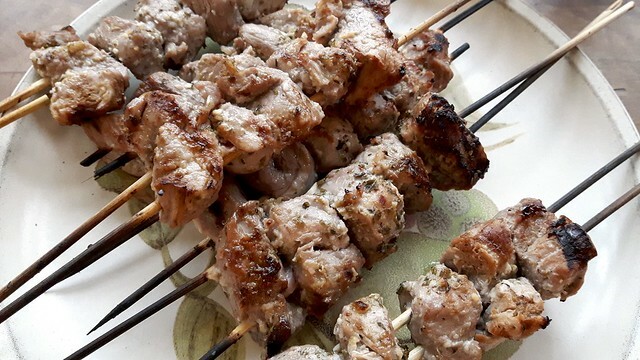 But it’s actually pretty easy to make your own souvlaki at home, provided you have some time to prep. Here’s how you can do it. 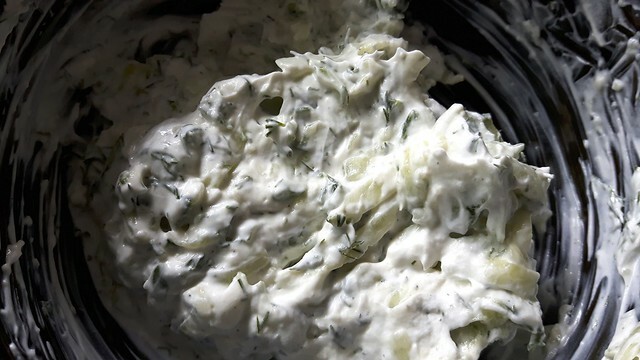 First, let’s start with that most essential of condiments: tzatziki. You can always buy this but it’s easy to make as well. I rarely measure my amounts because I find they vary depending on my mood but here’s an approximation for you. 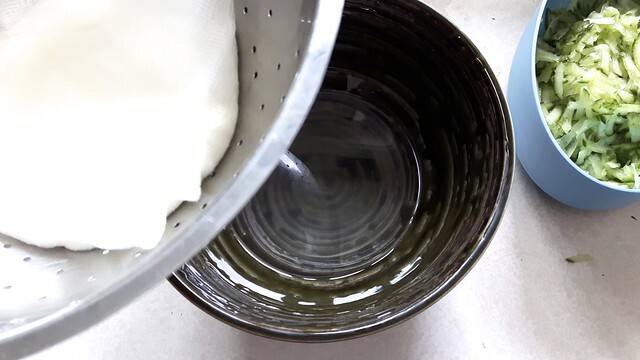 Start off by grabbing about 1/2 cup plain yogurt and plopping it in a few layers of cheesecloth in a colander. Wrap it well and put something with a bit of weight on top. 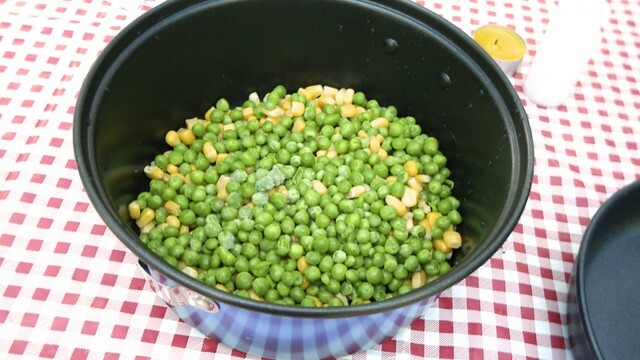 Place the colander over a bowl and shove it in the fridge for a few hours. 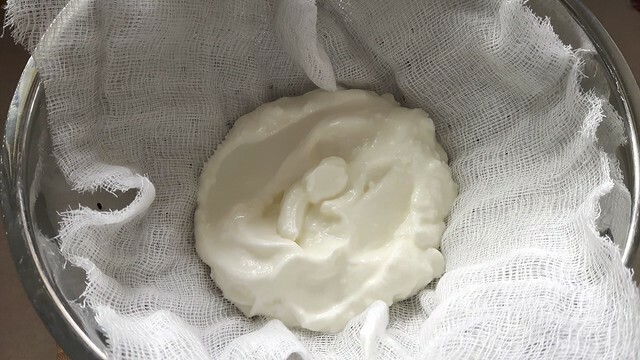 I use Balkan style yogurt for this, but if you have Greek yogurt you can skip this step. 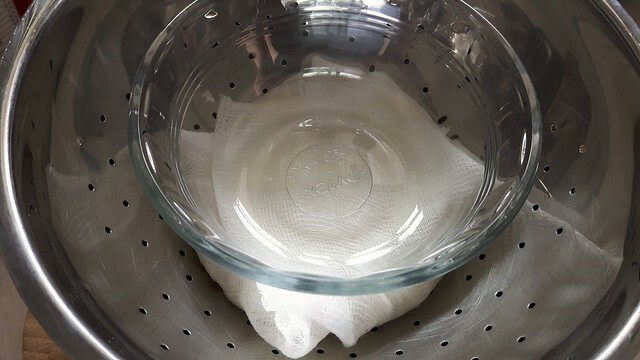 After your yogurt has been pressed and some of the water has drained out, you can unwrap it and give the cheesecloth a bit of a rinse. You’re going to need it in a second. 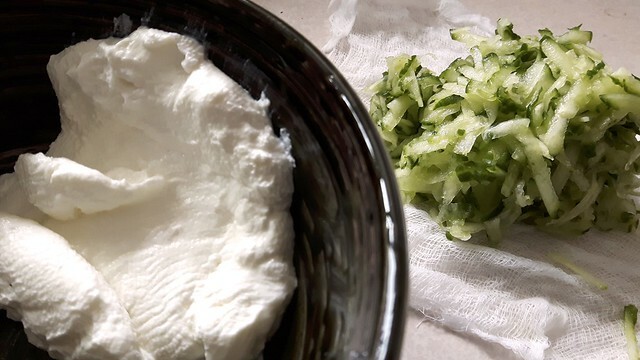 Grate up about half a cucumber. 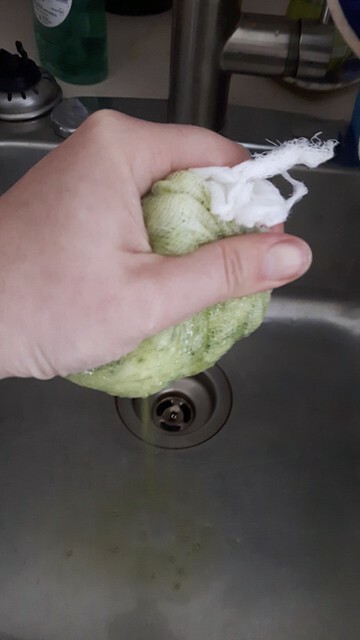 Plop the cucumber bits onto the cheesecloth, wrap it up, and give it a good squeeze over the sink and get rid of excess water. 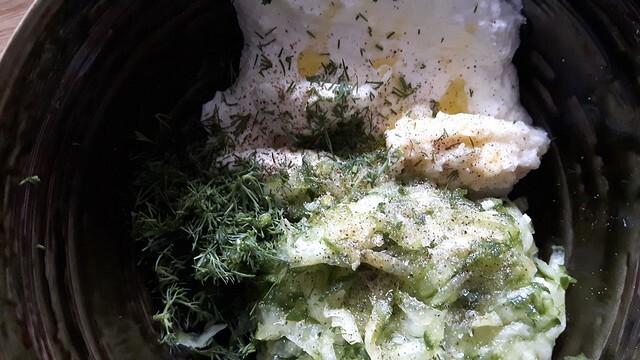 Now, tip that into a bowl together with the yogurt, some minced garlic, chopped fresh dill, salt, pepper, a few drops of lemon juice, and a drizzle of olive oil. Stir, stir, stir! 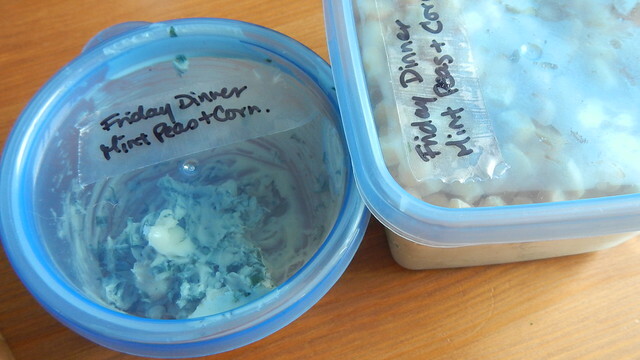 Shove that back in the fridge for a few hours (preferably overnight) to let the flavours mingle. 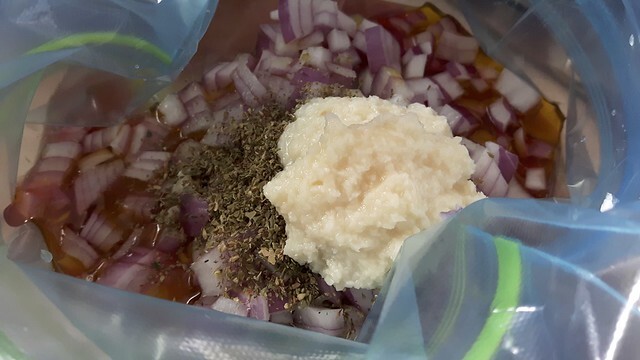 For the souvlaki we’re going to create a marinade. 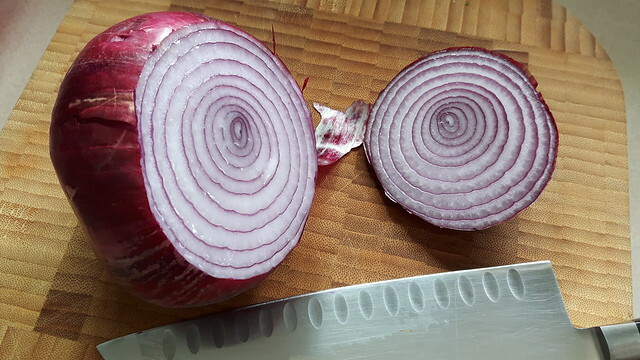 Start by finely chopping up a small red onion. 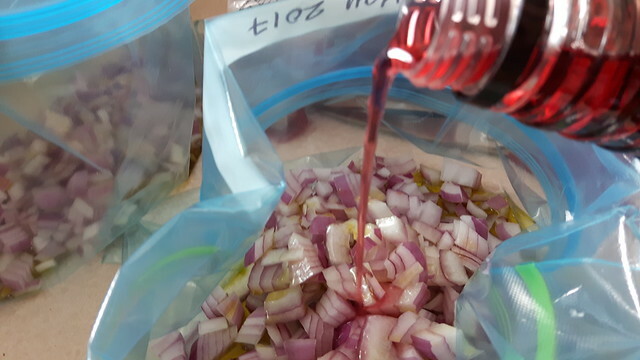 I’m being smart here and using a large red onion because I’m making the recipe twice and chucking half of it in the freezer. and 4 tablespoons lemon juice. 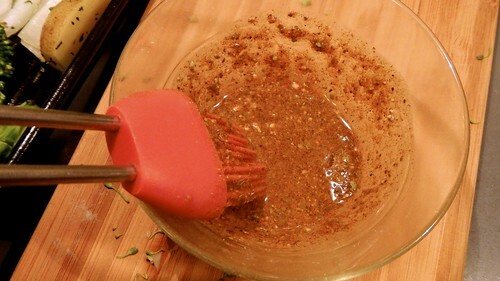 Next plop in about 2 cloves minced garlic, 2 teaspoons dried (or fresh) oregano, and of course salt and pepper to taste. 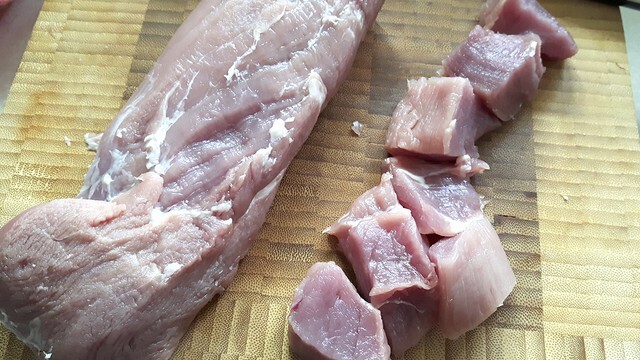 Wrangle yourself a decent-sized pork tenderloin (you can do this with chicken breast too). 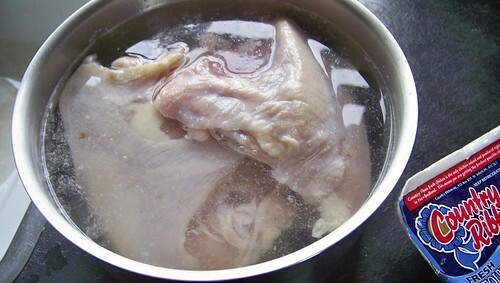 Don’t be tempted to use a pork shoulder or any other cut for this, as they’ll be too gristly when cubed. Trust me. I did it once when they were on sale and I regretted it. 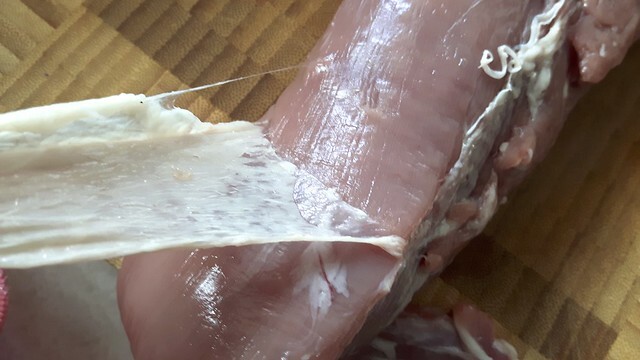 Pull the tough membrane off the tenderloin and trim any excess fat. 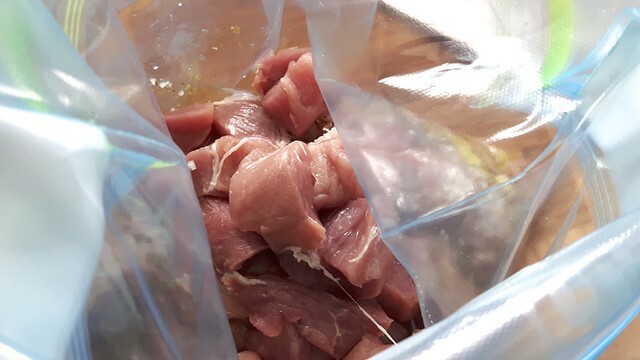 Chuck those cubes into your freezer bag. 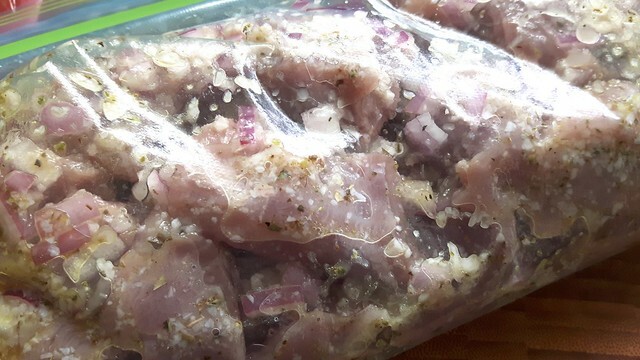 Seal the bag carefully, give it a good smushing together, and bung it in the fridge for several hours. While you’re waiting, grab some wooden skewers and plop them in a tray of water to soak for at least thirty minutes before you grill. 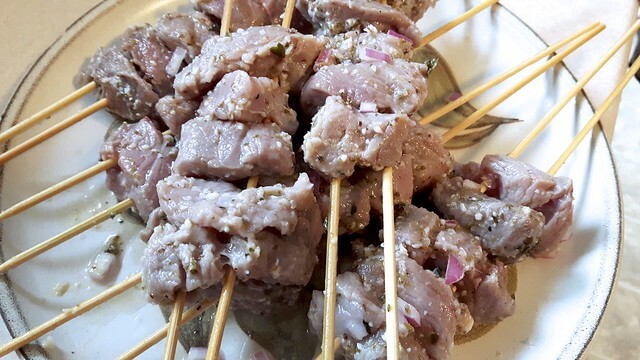 When you’re set to start, shove the cubes of marinated meat onto your skewers (I like to use two skewers per so that they’re easier to flip) and grill until cooked through and at an internal temperature of about 145°F. 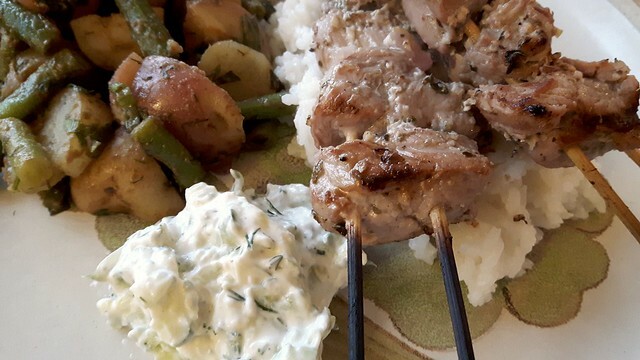 Serve over rice with a hefty side of your fresh tzatziki and enjoy the summer! 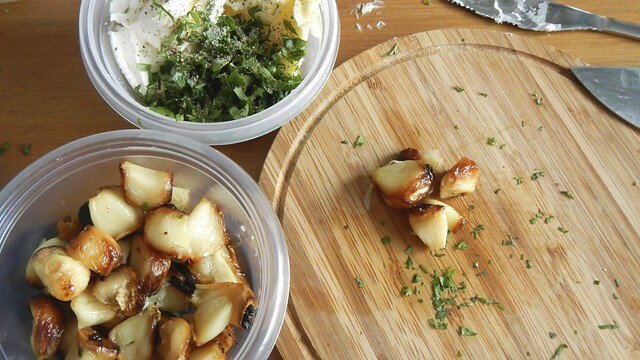 This is a great make-ahead meal for two for a short camping trip from The Camping Cookbook. I froze all the ingredients before we left so they would stay cool and solid until I needed them. Feel free to increase the recipe if you have more campers. You may have seen a few teaser shots of this from last week, because I was so very clever in my pre-preparation. 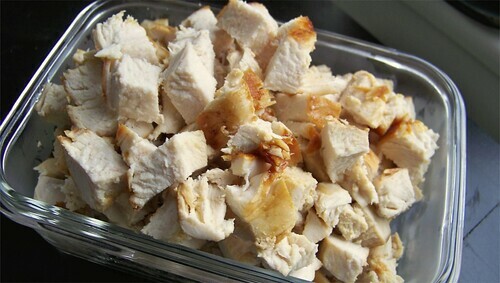 Start with 2 boneless, skinless chicken breasts. Slice those in half, lengthwise, so you have four long strips. 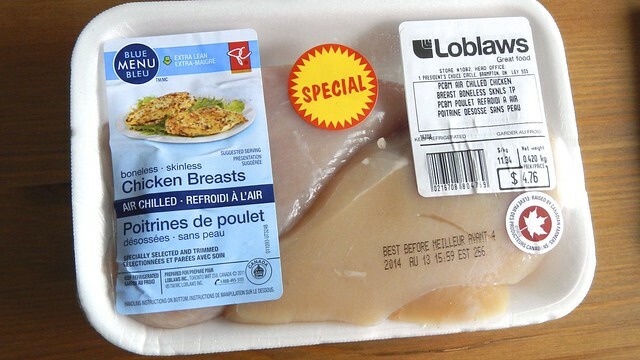 If you think those strips are too big, slice the breasts into three or four, depending on your preference. 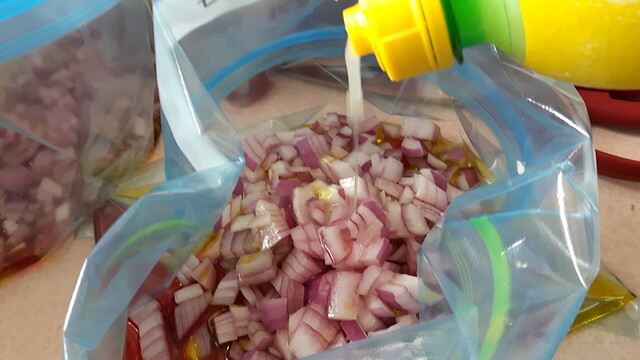 Mix together your marinade of 1 1/2 tablespoons lemon juice, 2 tablespoons water, 1 teaspoon granulated sugar, 1 teaspoon salt, and 3 teaspoons olive oil. 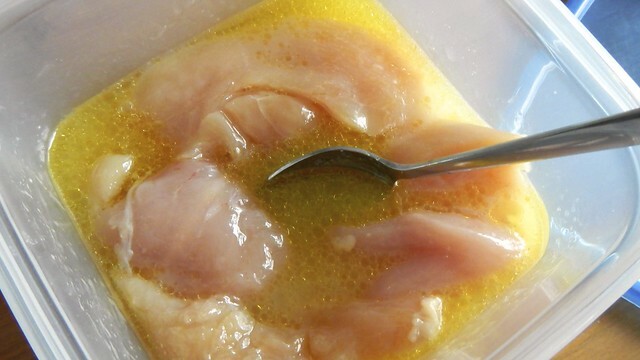 Shove your chicken into the marinade for at least 30 minutes(I put mine in a plastic container and froze it). 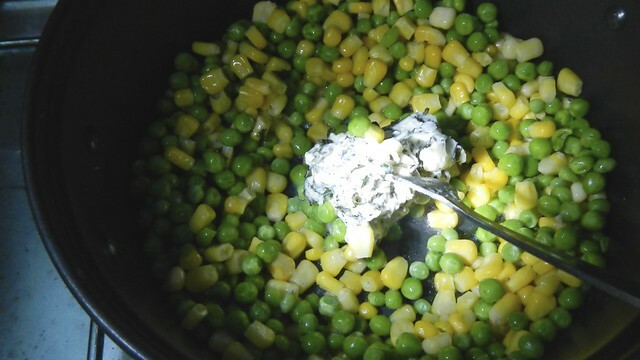 Meanwhile, mix up your lovely compound butter. 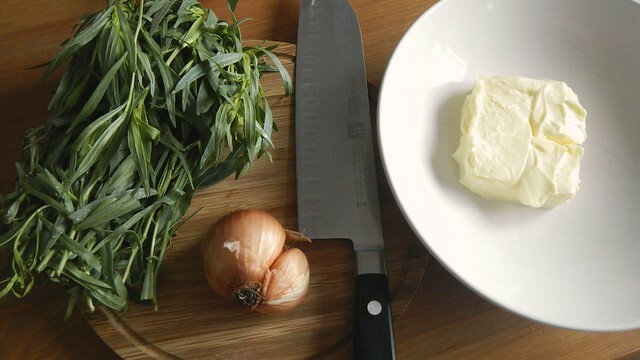 Stir together 1/4 cup softened butter with 1/3 cup fresh tarragon, chopped, and a finely minced shallot (use 1/4 of a small onion if that’s all you have). I chucked this in the freezer as well. 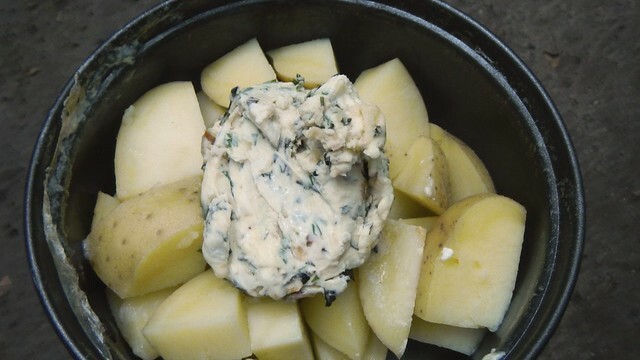 Serve hot with dollops of the tarragon butter on top. I actually forgot to pull out the butter until we were all done so I put it in the hot pan to let it melt. 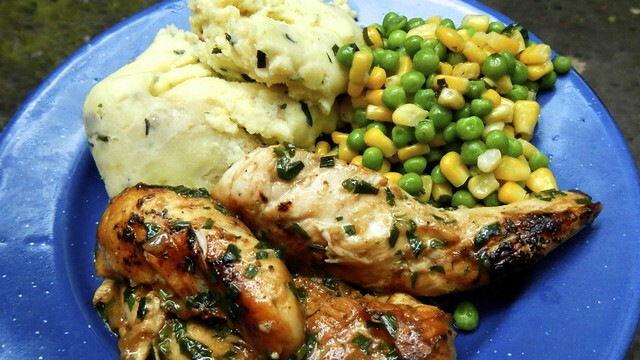 We served this with some peas and corn and garlic mashed potatoes. 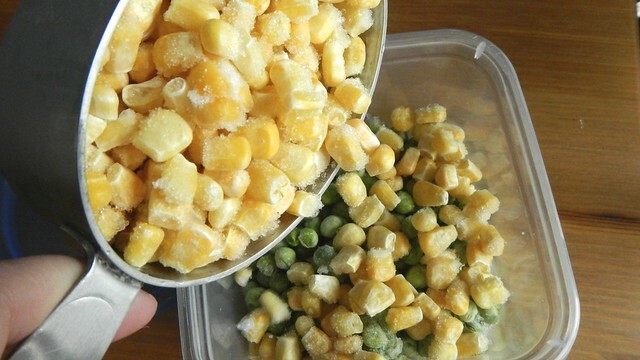 For the peas and corn, mix together 1 cup frozen peas and 1 cup frozen corn and steam for a minute or so until cooked. 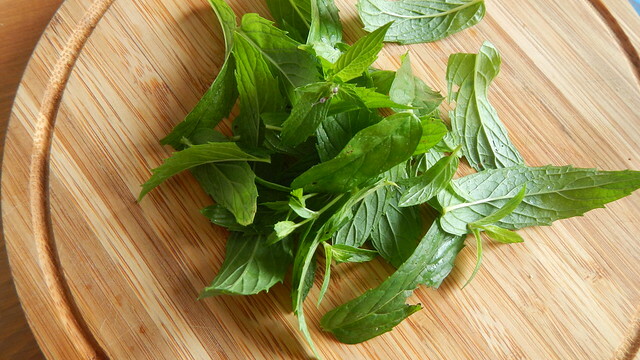 Toss the cooked vegetables with 1/4 cup finely chopped mint and 2 tablespoons butter. 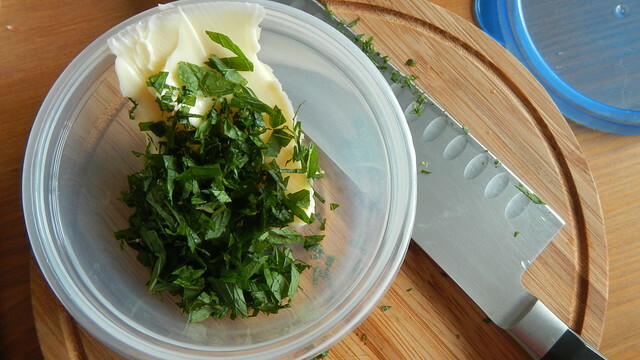 Again, I mixed the herbs into the butter ahead of time and froze it. 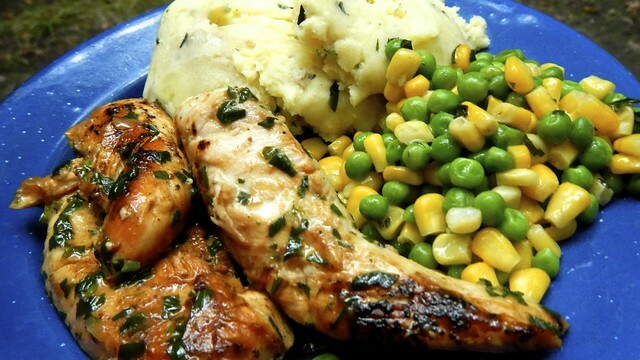 For the potatoes, boil and mash 2 potatoes of your choosing. I like to leave the skins on. 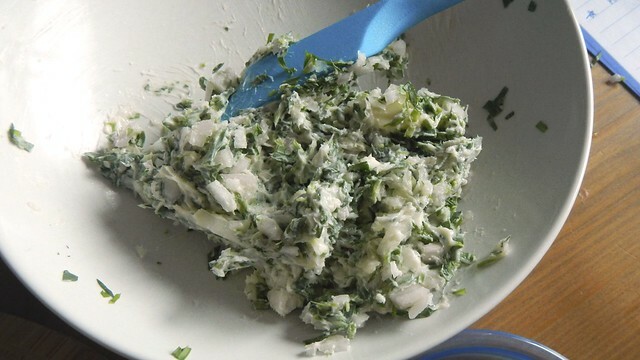 Scoop in 2 tablespoons butter, 2 tablespoons cream cheese, 2 teaspoons mixed herbs (fresh or dried, your choice), and 2 teaspoons minced garlic (I made a compound of this ahead of time) and serve. TADA. Gourmet in the woods. 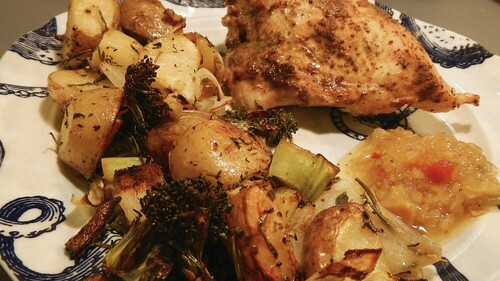 Sometimes you want all the comfort and rustic homeyness of a roasted chicken and crackling roasted vegetables, but you don’t have the time or the inclination to go through all the bother. In our case, we also don’t have enough people in the house at the moment to eat a whole chicken. So here is my solution. 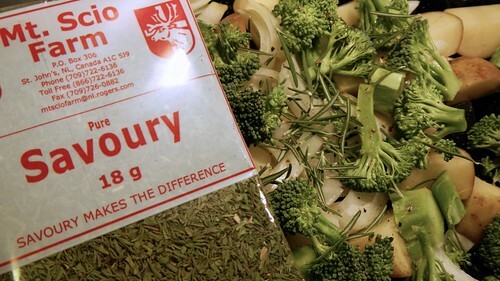 Take a small roasting pan and a handful of vegetables you’d like to roast. 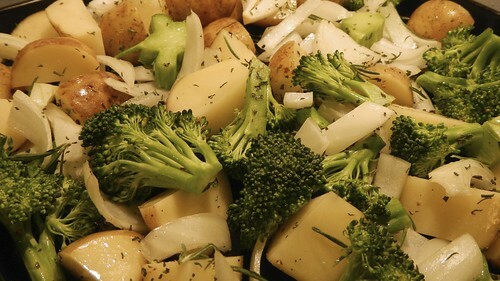 Here I have half a large onion, several small white potatoes, and a head of broccoli. I tossed those in olive oil and seasoned them with salt, pepper, fresh rosemary, and Newfoundland savoury (thanks Fussellette!). 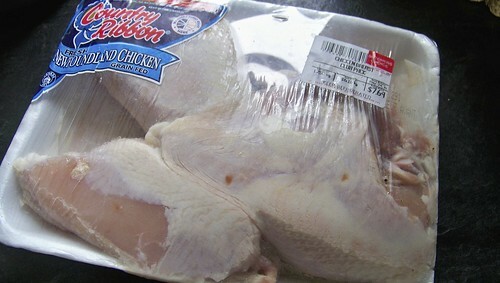 On top of that, I set 2 large bone-in chicken breasts. Bone-in roasts better than bone-out, trust me. 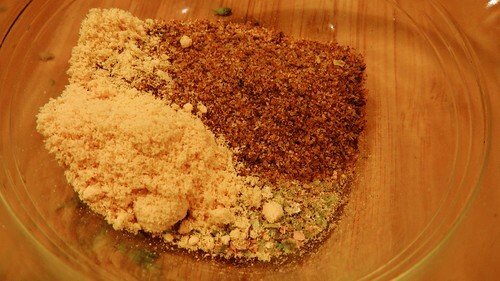 In a small bowl I mixed together salt, pepper, Old Bay seasoning, and some dry mustard. 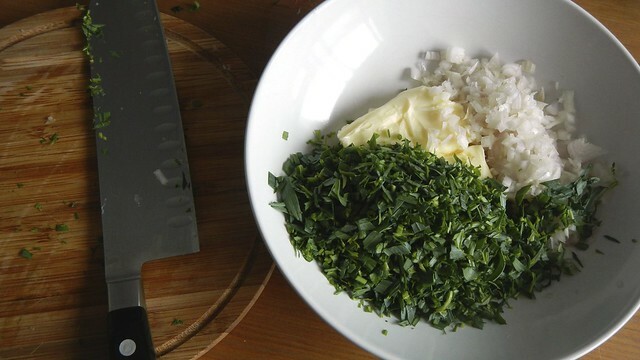 Then I added a little lemon juice to it to turn it into a paste. This paste I brushed on top of the chicken breasts. 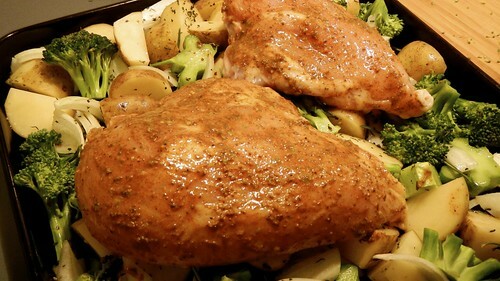 Then I roasted everything (in my toaster oven, no less) at 400°F for about 30 minutes, stirring the vegetables occasionally, until the chicken was cooked through and the juices ran clear. 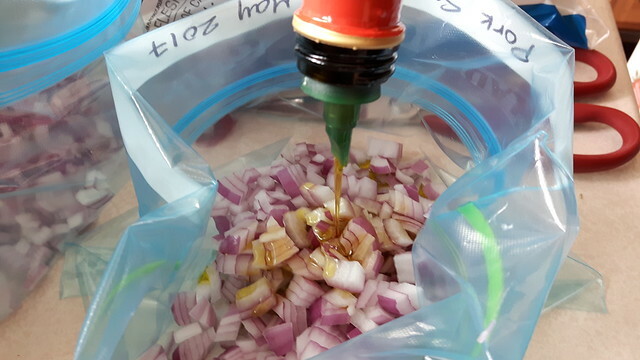 I served it with some Vidalia onion relish that really helped to pick up the flavours. Yum. 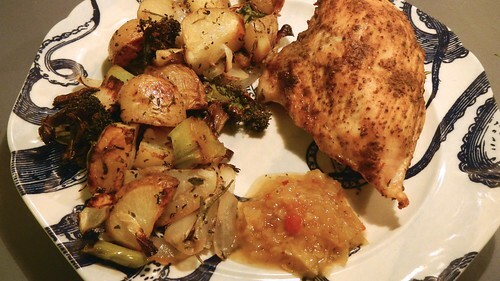 Rustic comfort food for two! I got this recipe from Canadian Living, but I would say it’s more of a cross between an enchilada and a burrito than it is a full-on burrito, especially after my modifications. You tend not to bake burritos and there are lots of refried beans involved. 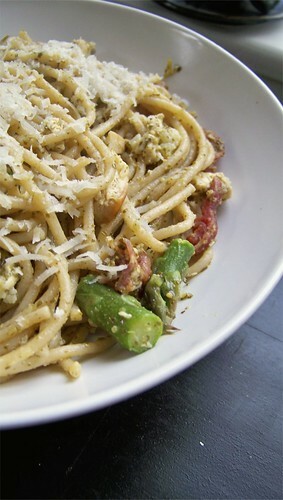 In any case, it’s easy, it’s quick, and it’s hella tasty. It makes about 10 6″ wraps. 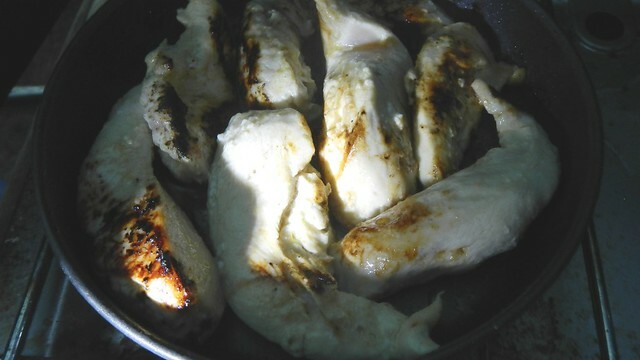 Start with 3 large chicken breasts, still on the bone, and poach them in gently simmering water until cooked, about 15-25 minutes. 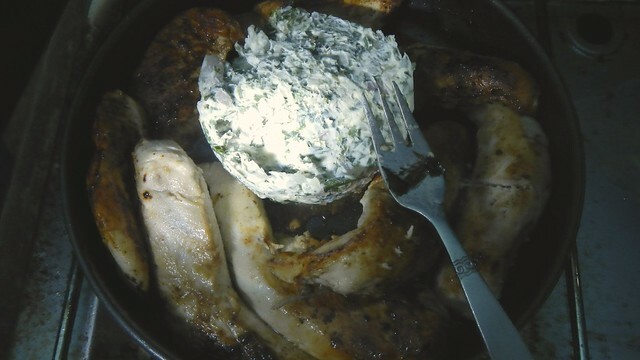 Then shred the meat with forks, in good southern style. Set that aside. 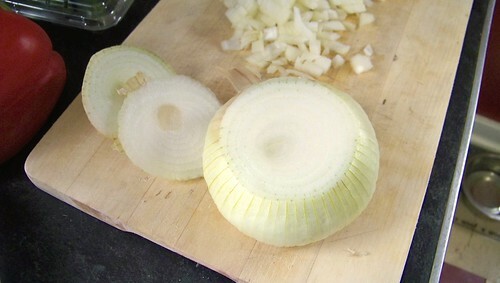 Dice a large onion and plop that in a wide frying pan with some olive oil and minced garlic and sauté those suckers until they are tender and translucent. 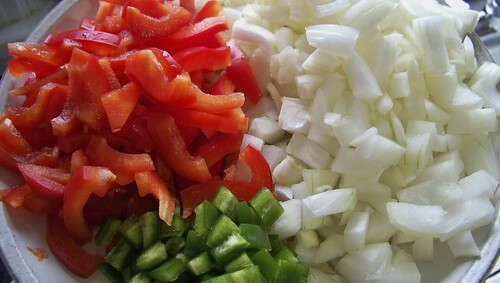 Chop up as well a red pepper and a jalapeño pepper. 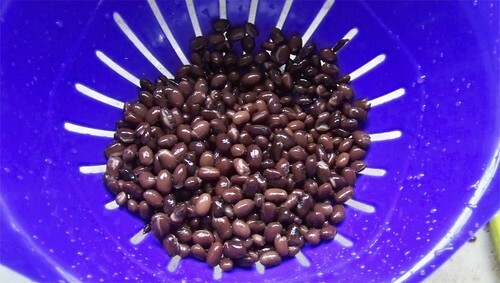 Drain and rinse a can of black beans. 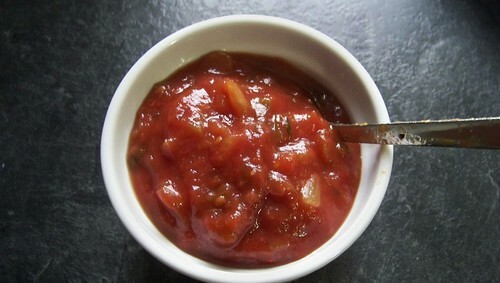 Wrangle yourself 1 cup salsa. I say “wrangle” because that’s what I did with this — it was in three different jars as I was cleaning out the fridge. 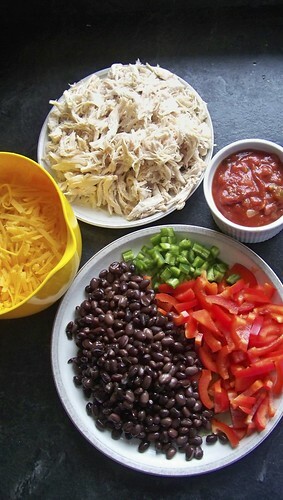 Toss the peppers, beans, and salsa into the pan with the onions, and add the chicken as well. 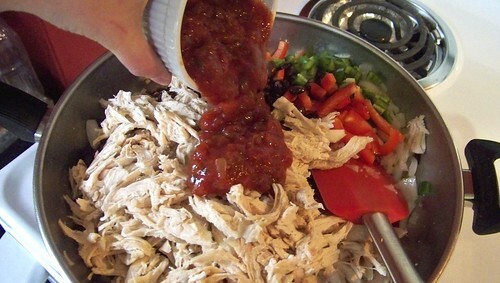 Stir everything around to coat with salsa — I found I needed to add a little bit extra to get it all covered. Season with salt and pepper. 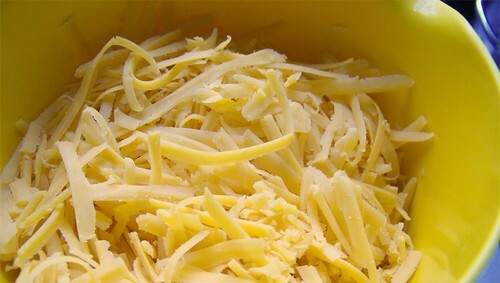 Grate up about 2 1/2 cups cheddar cheese and set that aside for a bit. 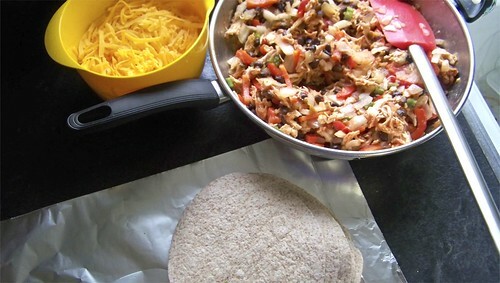 In a greased dish or on a sheet of aluminum foil, lay out a flour tortilla. You can use any kind you want, but I used the small whole wheat ones, just to make this a bit healthier. Spoon in a generous amount of filling (you will likely have a bit left over so don’t be afraid to go overboard). Sprinkle the filling with a bit of cheddar cheese. 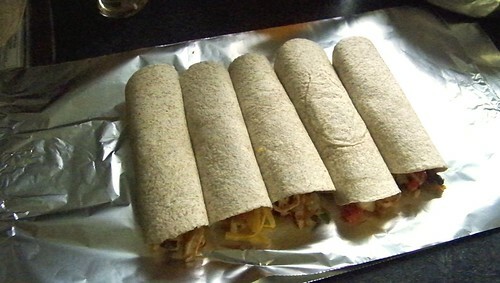 Roll the wrap into a cylinder and place it in your dish or on the foil with the open side down. Repeat with the other wraps until you run out. 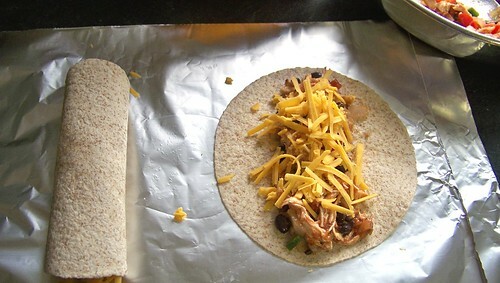 Sprinkle the remainder of the cheddar across the tops of the burritos. 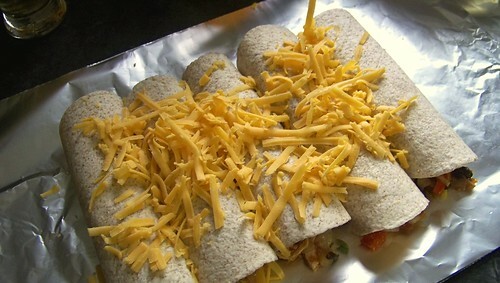 Bake at 400°F for 15 minutes, until the cheese is melted and bubbly and the wraps turn golden brown. Or wrap tightly in foil and freeze. 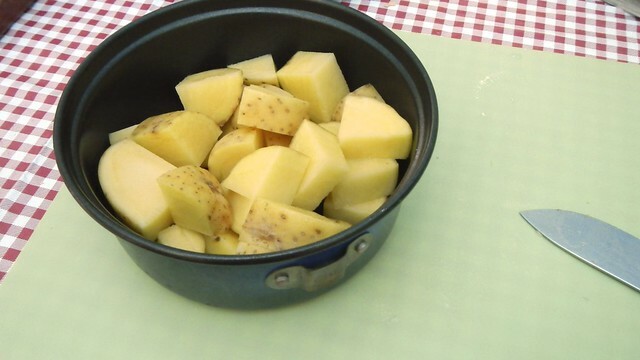 You can bake these from frozen, just increase the cooking time to 25 minutes. 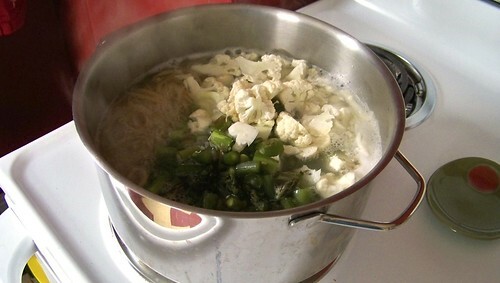 Serve them with sour cream and chopped green onions. HAPPY CANADA DAY! Be safe and well today! 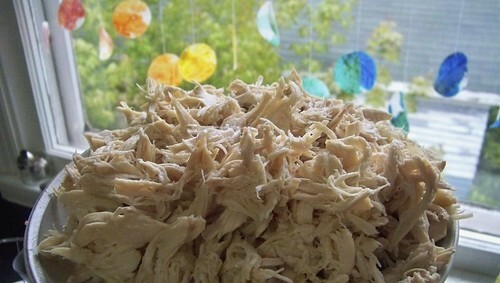 This recipe is a good and quick one if you are heading out to your local festivities today. Of course, if you’re in Ottawa today, the third-largest party in the world (supposedly, the first-largest is New Year’s Eve in Kuala Lumpur, second is NYE in Times Square, NYC, and the third is Canada Day in our nation’s capital) is going to be extra big with the Duke and Duchess of Cambridge in attendance. You’re going to want to make sure you eat enough to have energy for the party. 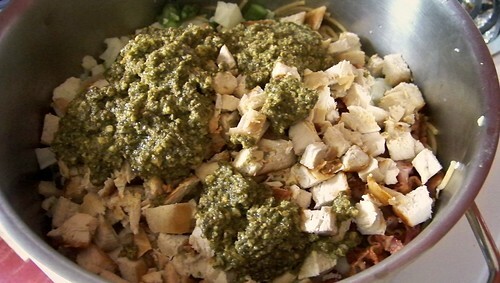 The Pie wants me to let you know that normally, we use pesto that we’ve made ourselves from scratch, but that this year is a bad one for our basil, so we went with store-bought instead. But he wants you to know that normally we don’t stoop to such levels. 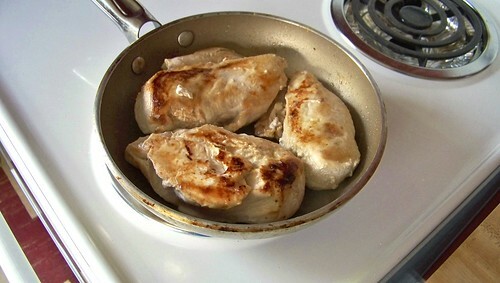 Set a pot of water a-boiling and fry up a couple (or a few) boneless, skinless chicken breasts. 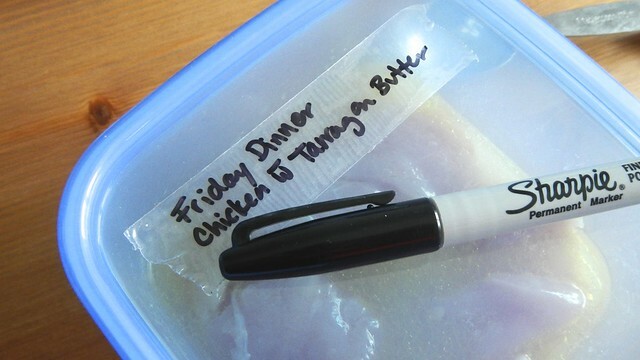 If you have leftover chicken lying around, this will do as well. Once the chicken is cooked through, cube it up. 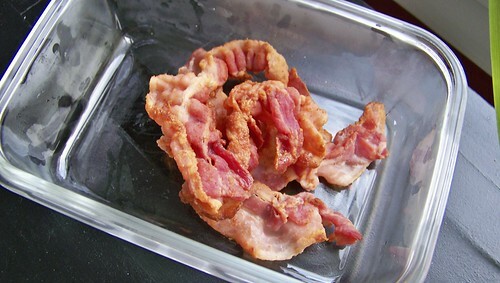 Leftover bacon? I know, it’s like a mythical creature. But we had some. So I shredded that. 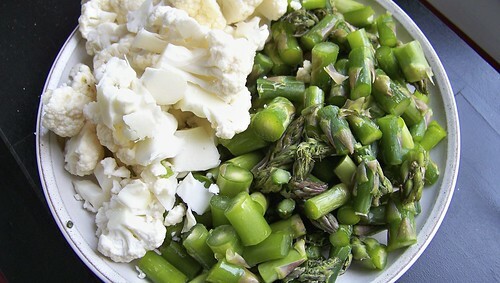 We had some asparagus and cauliflower lying around, so I cut those up into bite-sized pieces as well. Whatever vegetables you have on hand will do, of course. Red peppers, perhaps, or onion. Chuck enough pasta in your boiling pot to feed four and cook it according to the package instructions, usually for 10-12 minutes. 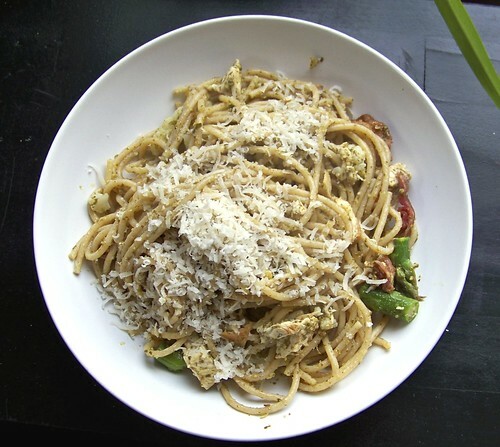 We used whole wheat spaghetti here, but penne and rigatoni would work equally well. For the last two minutes of your pasta cooking, chuck in your vegetables, just to get them a wee bit soft. 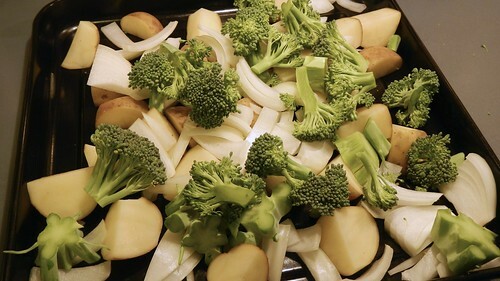 If your vegetables are already cooked, I would skip this part, otherwise they might get soggy. 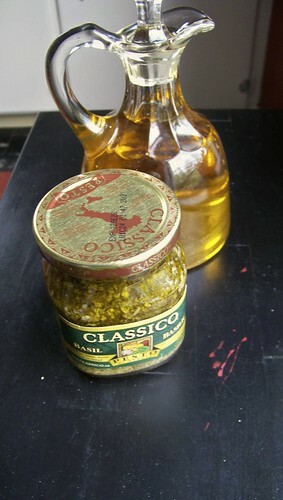 Drain the pasta and toss in your meats, as well as about a cup of pesto (the store-bought stuff, at least. If we’d made it from scratch we probably would have used less). 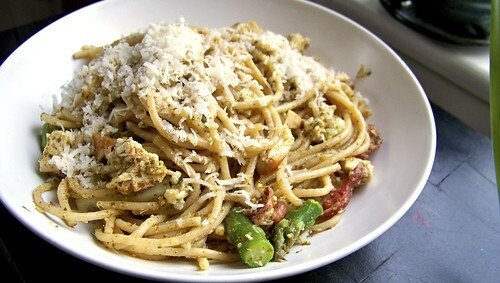 Toss well to coat the pasta and circulate the vegetables and meat, then serve, topped with grated parmesan cheese. Utterly fantastic the next day as well. You can serve it hot or cold!